We were invited to a friends birthday and I was looking for a little something for him. Regular recipes can be sometimes time consuming and big in the amount the rendered. So, I figured I could check the book so see if I can find something. The table of content is divided into: Morning Bites, Sweet Snacks, Classic Bites, Fancy Stuff and Frostings, Fillings, Toppings, and Drizzles and under these main sections you will find every single recipe. Each recipe has a short sentence that add to the recipe name. Like: “Pairs well with life.” for the Wine & Chocolate Lava Cake. Next beside it you will also find the amount the recipe should yield. Each recipe is neatly listed and steps are number so you know where you are. Also, sometimes you will get a sweet tip, something extra. 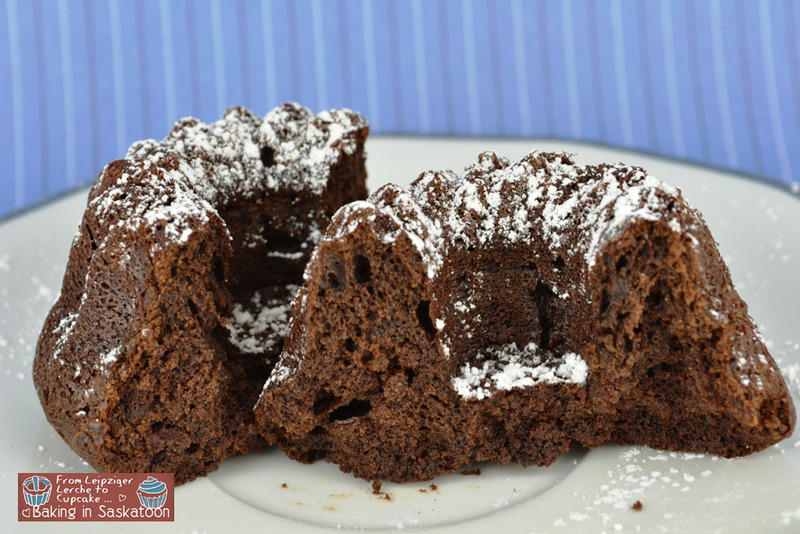 For the lava cake it tells you how to make it a regular moist chocolate cake. Not every recipe has a tip though. Unfortunately, not every recipe has a corresponding picture. I know, that’s tricky because of printing and costs and such, but the whole book is done in glossy paper and in colour. Personally, I think adding a handful more pictures would have been no problem. Second issue I have is the binding. After one use it already comes slightly apart. I know that that can sometimes happen but I believe I was not particular rough with it. Generally speaking though I enjoy this cook book a lot. The quality of the books is wonderful, the paper is nice, I like the flaps on the cover and back so I can “mark” a recipe for easier find. The size of the book is also quite nice, it’s small and square and could be put into a purse easily for travels. Excerpted from Petite Treats – Mini Versions of Your Favorite Baked Delights by Christy Beaver and Morgan Greenseth. Copyright © 2012 by Ulysses Press. Reprinted with permission from the publisher Ulysses Press. 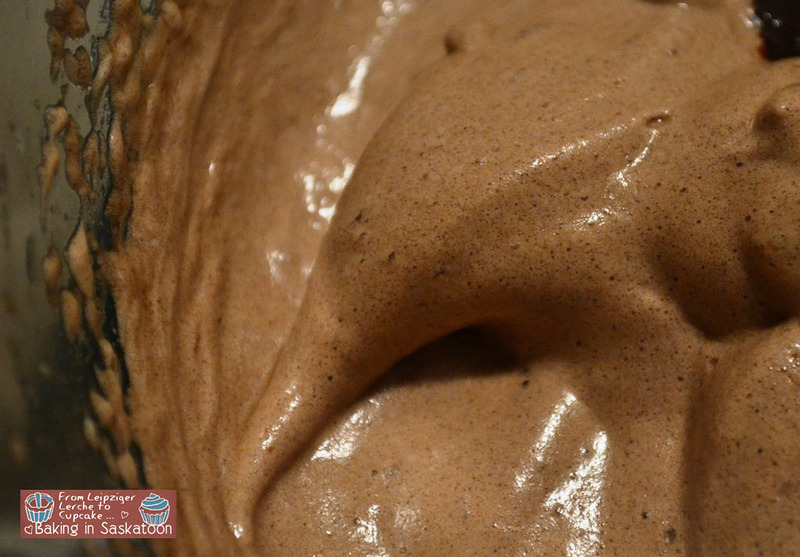 Soft peaks from egg whites mixed with cocoa mix. This recipe was super quick. The longest it took was for the chocolate to melt. Even baking was very fast. 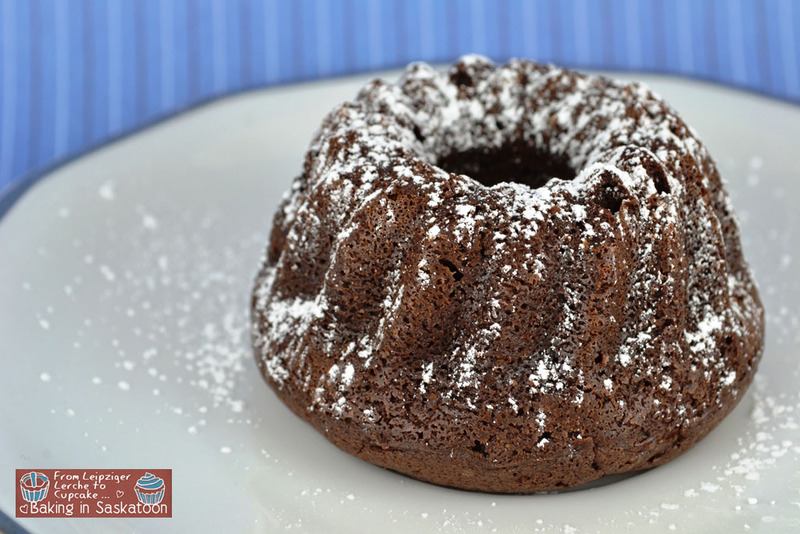 Preheat the oven to 350°F or 180°C and take out a mini Bundt pan. Tip 1: I had one with 6, since this makes 9 you either bake twice to use another little form. The other form I used had bigger wells which changed the baking time a bit. Sift flour, cocoa powder, and 2 tbsp. of sugar together into a bowl, set aside. 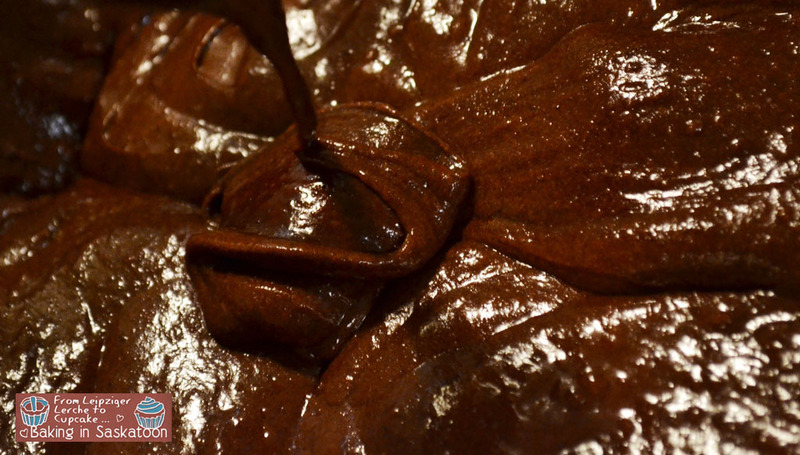 Melt butter and baker’s chocolate in a small saucepan and stir until combined. Remove from heat before adding the wine, the rest of the sugar and the egg yolks. Make sure the mixture is not too hot or the egg will scramble. Beat the egg whites with an electric beater until foamy, then add 2 tbsp. of the cocoa-flour-sugar mixtures. Beat until soft peaks will form. This might take a bit on high setting. By hand, fold in half the chocolate-butter-wine mixture, followed by half of the dry mix of cocoa. Then add the remaining chocolate mixture and finally cocoa mixture. Make sure you are carefully folding. 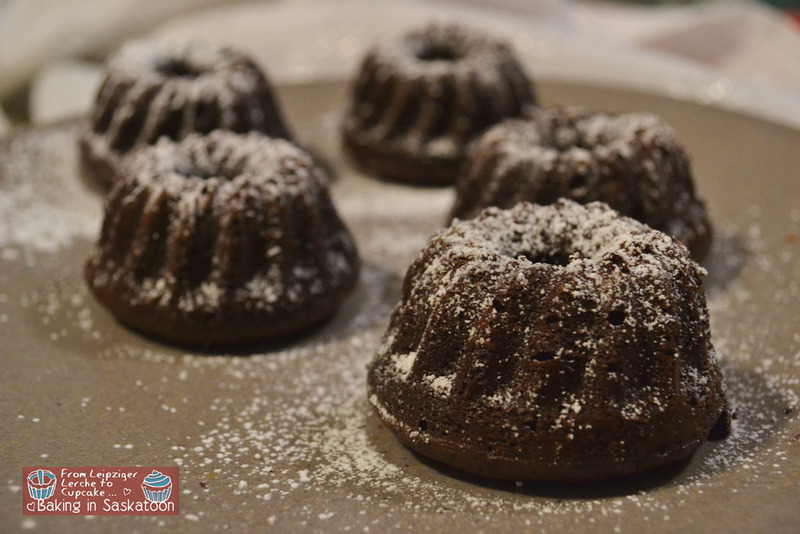 Fill the mini Bundt molds to the brim and bake for 10 min without turning. Remove from the oven and let it sit for about 3 min in the mold before turning them onto a cooling rack. Dust with icing sugar and wait another 5 min before eating. Tip 2: Check the cakes before removing from the oven. Since I had a silicon form, mine were quite soft and I added about 2-3 min more. The outside should be firm so they can hold the shape. Tip 3: I turned them onto a plate, which should be lightly dusted with icing sugar. I doubt that a rack would have worked, they are quite delicate. The cakes are moist and very chocolate heavy. Definitely something that should be enjoyed with a Merlot. YUM! This looks delicious. thanks for sharing on Foodie Friends Friday and would appreciate if you would link your recipe back to us. Hope you will join us again this week.